Ryan Beaumont, shown in this Friday, Dec. 30, 2011 photo, is the owner and founder of Brunswick-based R.M. Beaumont Corp., which has seen steady growth in the past few years on a range of projects. One of the new firm's major clients is Ocean Renewable Power Company of Portland, which is developing a tidal energy turbine, a model of which is shown in the foreground. The R.M. Beaumont Corp. in Brunswick has grown steadily since Ryan Beaumont of Topsham began running it out of his home since he earned a master's in engineering from the University of Maine in 2007. As of Friday, Dec. 30, 2011, Beaumont operates the business out of office space in Brunswick's Fort Andross and has hired three employees. 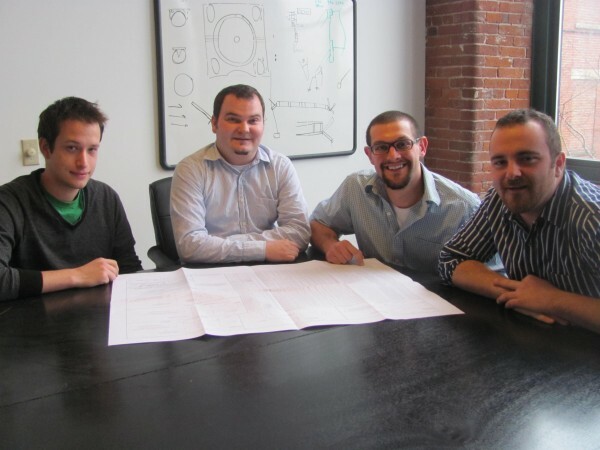 From left, they are research engineer Seth Gray, Beaumont, research engineer Curtis Libby and business manager Patrick Pottle. 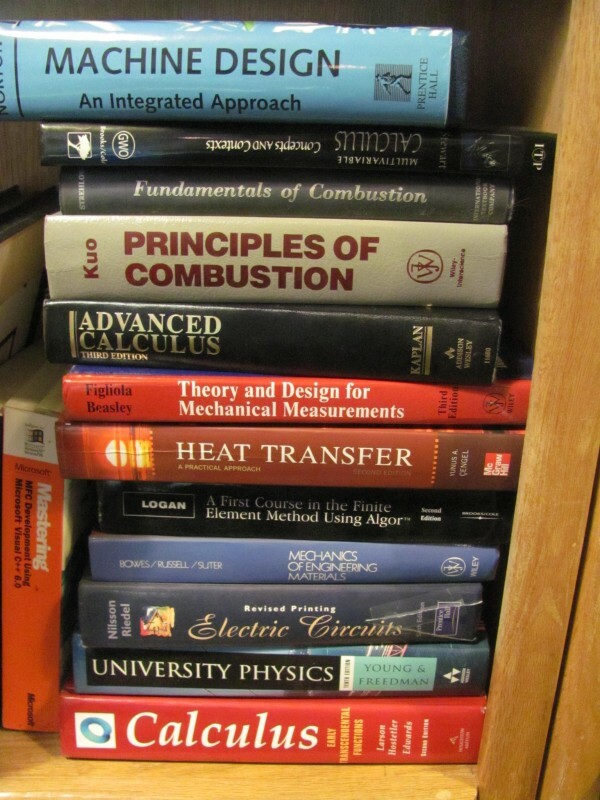 Mechanical engineering isn't exactly a light subject, as a stack of reference books within reach of Ryan Beaumont's desk in Brunswick can attest. Beaumont, who is a graduate of the University of Maine, is the owner of R.M. Beaumont Corp. in Brunswick, which in its short history has found a niche offering both engineering and computer programming services, much of it associated with green energy technology. BRUNSWICK, Maine — The growth of the R.M. Beaumont Corp. into a niche market was all sort of an accident, according to its 29-year-old founder, Ryan Beaumont. As a student at Cape Elizabeth High School, where Beaumont graduated in 2000, his first foray into the engineering world was through a self-trained hobby of using the components from obsolete computers to build more powerful ones. Along the way, he learned the basics of writing computer software. A positive experience in high school physics and drafting classes led Beaumont to study engineering at the University of Maine, which led him to securing a master’s degree in mechanical engineering. Even before he had his degree in hand, Beaumont was working as a consultant on several projects. Just four years out of school, Beaumont is the owner and founder of R.M. Beaumont Corp. in Brunswick. Despite never spending a dime on advertising, the firm’s workload is such that Beaumont has taken on three new employees in the past several months. He attributes his early success to two factors: his firm’s unique dual capabilities in computer programming and mechanical engineering, and being small enough to respond to clients’ needs quickly. Not only has work continued to come Beaumont’s way without him necessarily asking for it, but a lot of it has been on the cutting edge of green energy technology in the state. His firm has been involved in testing and development of the offshore wind turbines under development by a consortium of businesses and an experimental tidal energy project in Eastport, which is being led by Portland-based Ocean Renewable Power Co. Beaumont also has subcontracted for the paper industry in Maine and beyond, as well as a slew of other projects in various sectors. In some cases, Beaumont is called on to research and develop structural and mechanical elements on other companies’ vast projects. 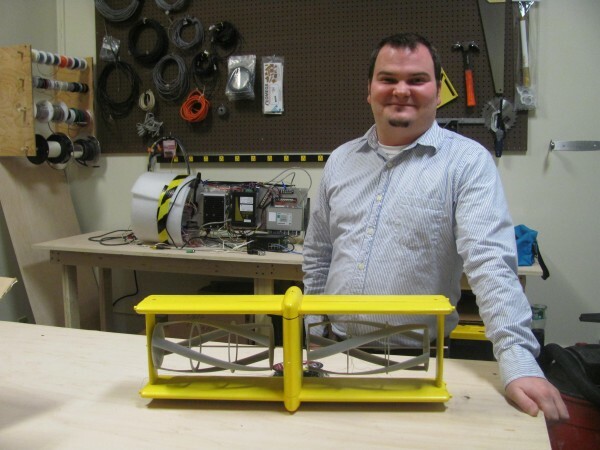 In the past year or so, though, he and his three employees have spent a lot of time doing a variety of durability tests on green energy components, including a scale-model ocean-based wind turbine at a facility in the Netherlands and Ocean Renewable Power Co.’s tidal generator. In some cases — such as with the tidal generator — Beaumont and his employees have written one-of-a-kind software that helps coordinate the components of a larger mechanical system. As it turns out, there’s a need for those kinds of specialized services. That’s good news for Beaumont who, like a lot of other college graduates, was tempted to move away to someplace such as the Gulf of Mexico, where he could have landed a job with a handsome salary in the petroleum industry. Beaumont’s wife, Kate, whom he met in college, is a structural engineer working at Bath Iron Works. Maine economic development officials have long fretted over what is known as the “brain drain,” which is when promising Maine students move out of state for jobs. In recent years, as the state has maneuvered toward creating on- and offshore wind farms and other forms of green energy, the chorus for more engineers in the state has become constant. Beaumont said that means on one hand there are few engineering jobs available in Maine, but on the other hand it means there is work available for people with the skills to perform it. Beaumont, whose business grew more than 100 percent between 2010 and 2011, said he is exploring and bidding on some new contracts, which will further diversify his clientele. If he lands that work, he said he expects to hire more employees in 2012.